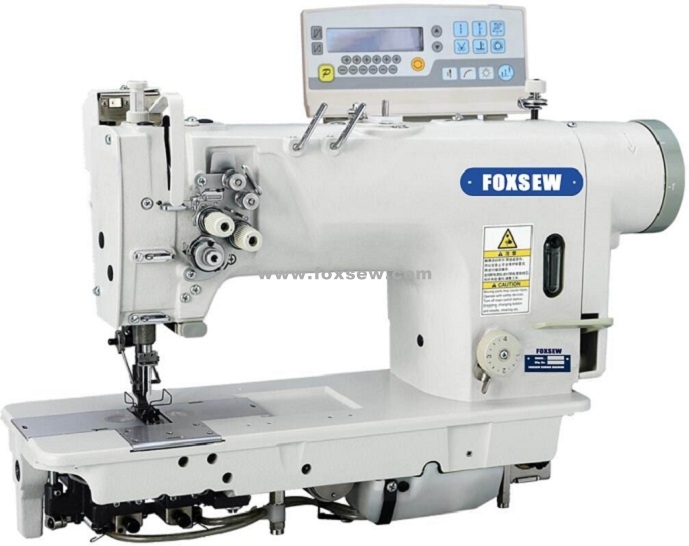 FOXSEW Computer-Controlled Direct Drive Fixed Needle Bar Double Needle Lockstitch Sewing Machine, with Automatic Thread Trimmer, Automatic Needle Counting, Automatic Reverse Sewing, Automatic Needle Position, Automatic Thread Swapping, Automatic Presser Foot Lift, etc... Straight Knife Automatic Thread Trimmer makes the sewing more stable and high working efficiency. 1.Double needle clutch needle bar structure to ensure precision in turning, right angle, acute angle and straight sewing. 2.Synchronized fabric feeding of needle bar and feed dog to prevent fabric slip, fine adaptation to fabrics and nice in stitch. 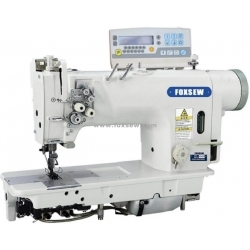 Fine adaptation to high quality double stitch and decorative sewing work. sewing models. Dramatically improve work efficiency. 4.Best design of outlook, interior structure, easy to maintain and use.